I mentioned in a previous post that my friend, Shelly, brought be some lovely goodies from her garden! 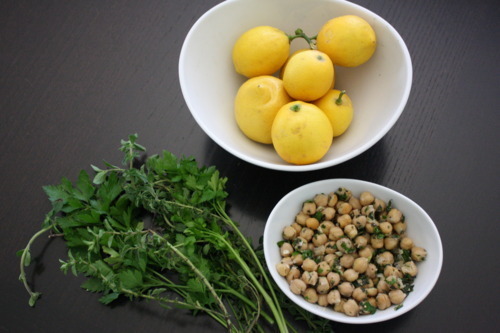 She gave me a wonderful idea for an “herbed chickpea salad.” I love chickpeas, so for today’s lunch, I prepared my own version using her fresh lemons & herbs. 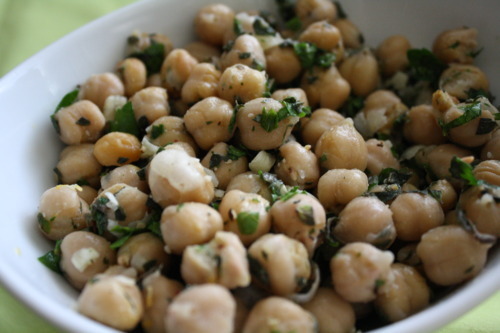 Combine chickpeas with the lemon juice, herbs, olive oil, garlic, & red wine vinegar, salt & pepper. Set aside to allow flavors to combine. Top with fresh lemon zest & a sprinkle of vegan parm! This salad is light & fresh, packed full of zinc, folate, & protein, & has tons of zesty flavor! Great as a snack, a side dish, or tossed with peppery arugula as a hearty main-dish salad. Enjoy!